Are you part of a campaigning organisation? 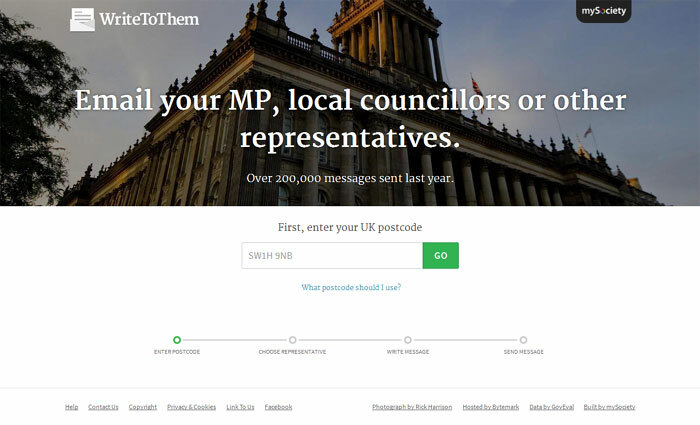 If you ever ask your supporters to write to politicians, you should know that WriteToThem can be integrated into your website simply, and for free. Like all mySociety’s offerings, WriteToThem is really easy to use. All your supporters need do is input their postcode and compose their message, then we send it off to the correct representative. From your side, there are no worries about data management or CRM integration – we take care of all that at our end. Behind the scenes, we’ve included several safeguards that prevent abuse: for example, your supporters will only be able to contact their own MP, not bombard other representatives with messages they’re unable to act on. We also check that messages have been safely accepted by the representatives’ servers, and we even follow up to ensure that your supporter received a response. WriteToThem is free for you, and free for your supporters. It’s available to every sort of organisation, from any part of the political spectrum. You can include WriteToThem’s functionality onto your own site, and even template it to match your own styles so that it’s a seamless experience for your users. You will need just a little technical expertise: the instructions are here. Here’s a case study that shows how one charity used WriteToThem in this way. If you don’t have any technical resource available to you, though, it’s still easy enough to harness the power of WriteToThem. The quickest and most straightforward way is, of course, to include a link to the WriteToThem homepage, from your own website or in your campaign emails. For a more sophisticated interface, take a look at this page, which has code that you can drop onto your site or newsletter. You can modify the code so that you only cover certain types of representative – for example, MPs, or MSPs. If you want to get fancy, you can even pre-fill the name and address fields for your supporters. There’s a very simple way to include WriteToThem on a WordPress site: through this plug-in. Installing it is just a matter of drag and drop. Start by reading our guidelines of use. We hope you’ll find WriteToThem to be a simple solution that really helps you rally your supporters to contact their representatives on the issues that matter. Please do drop us a line if you hit any problems, or would like to share your experience of using WriteToThem. Have you considered how this works from the recipient’s view point. It’s fine if only a few emails are sent, but what can an MP’s office do if they receive hundreds or thousands of messages on a particular topic? MPs sometimes have difficulty with mass mailing campaigns. When their mailboxes fill with tens of thousands of emails about a South American Rainforest, then it’s hard to know how to respond to them all (Outlook, Apple Mail, etc, just don’t have a “select all…reply to all these emails” function). And it’s hard to find the few emails about a local tree preservation order that the MP might actually be able to influence. It would be nice if you provided a tool for the MP to use for responding. Perhaps you could aggregate the emails from a campaign, summarise them, and send the MP a daily email with instructions on how to use your site to respond. Yes, we did put quite a lot of thought into how WriteToThem works for recipients – that’s the reason, for example, that the system detects and prevents identical messages from being sent out by different people. Of course, that doesn’t mean an individual representative won’t be inundated with correspondence on a single topic, but it does at least ensure that the writers are genuine and have taken the time to really express their points in their own words. In those cases I’d suggest that the MP does have a duty to manage the responses, by whatever means. I like your ideas for a tool to help them do that. Hello Ian — jumping in after Myf’s reply, I’d point out that when mySociety created WriteToThem, the issue of mass-mailing was indeed considered (see the note about mass-mailings), which is why, as Myf mentions, it won’t send a message that’s too similar to one that’s already been sent.